Your gateway to digital success! Get your early bird ticket(s)! Early visitors are rewarded, block your agenda and get your tickets soon! Early birds will receive an exclusive workshop during the event. Be part of this years TYPO3 international conference! See you in The Hague. Sponsoring the T3CON19 is a great way to support the project of TYPO3 and connect with the TYPO3 Community and potential new leads. Based on our experience with last events we have plenty of options for everybody to get represented. If you have your own sponsoring idea or if you have any questions don’t hesitate to contact us. A multi functional venue in The Hague! Housing a 2200 square metre aircrafthangar, nine metres high and with 35 metre wide steel doors, the heart of the characteristic Fokker Terminal, with its striking combination of steel, glass and concrete floors, has a beautiful, industrial feel to it. Constructed in 1959, the building was formerly used by the school for aircraft engineering and turned into an event venue several years ago. The main area can be used for events for 100 to 1,000 visitors. Adjacent are another 17 former class-rooms, ideal for workshops or group activities. These break out rooms are right next to the main hall, this makes it very convenient and easy to navigate. The adaptability of the hangar and its characteristic appearance, the terminal is also ideally located just on the outskirts of The Hague. Free parking, incl EV charging, available! Mid-scale hotel for business trips or leisure. Explore the beautiful city of The Hague and relax at the comfortable space of Mercure. Mercure Hotel Den Haag Central is located in the vibrant heart of The Hague and is easily accessible by car and public transport. The hotel is within walking distance of several ministries, the bustling shopping centre, many theatres and the beach is just 15 minutes away. We have 159 stylish rooms and a cosy bar where you can grab a bite to eat. Our hotel is also the perfect place to organize your meetings. 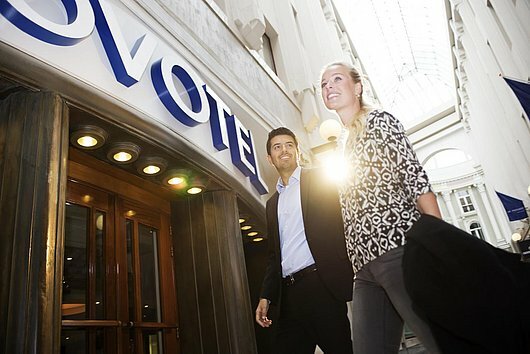 Novotel Den Haag City Centre is a 4-star family friendly hotel in the centre of The Hague, in a unique location in the Passage shopping arcade. Opposite the Binnenhof, close to the political heart of the Netherlands, the embassies and government buildings, the hotel is ideal for business trips. Whether you are visiting for business or a meeting, or want to explore the city's shops and museums, you will quickly feel at home at Novotel.